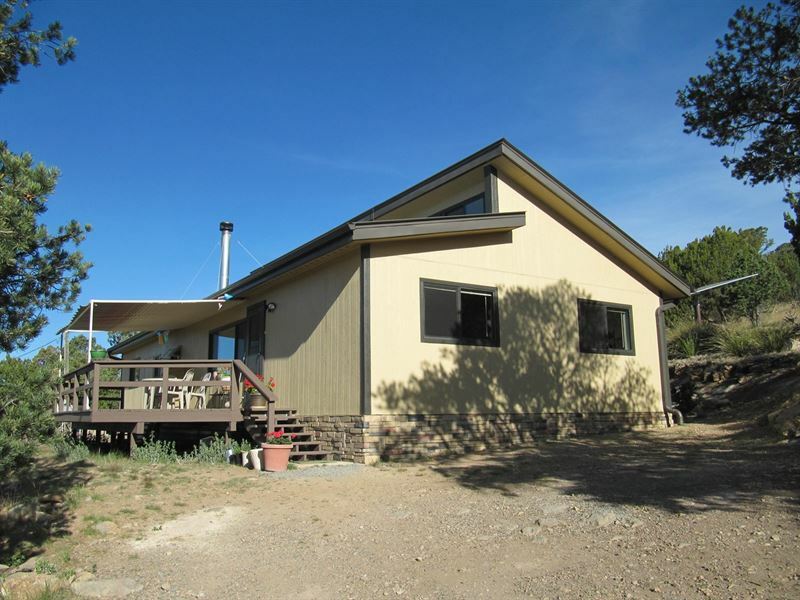 Energy Efficient Mountain Retreat For Sale Near Silver City NM. Custom energy efficient 3 bedroom, 1.75 bath home on 15+ rural acres. Vaulted ceilings, skylights, clerestory and large thermal pane windows provide a bright interior, while the 10'x32' deck with a retractable awning offers outdoor living space with uninterrupted panoramic views from Cooke's Peak to the nearby Kneeling Nun. The active solor photovoltaic system is both grid tied and a stand alone system with back up batteries. A new heat pump provides free heating and cooling. The attention to detail, quality construction and design affords you the opportunity to enjoy a low-maintenance, low-cost lifestyle.and there is an RV pad with full hook ups. Low flow private well and source for hauling water nearby. Only 15 minutes to town with the peace, quiet and privacy of country living.this is a wonderful, affordable retreat you have got to see.